This a sponsored post. 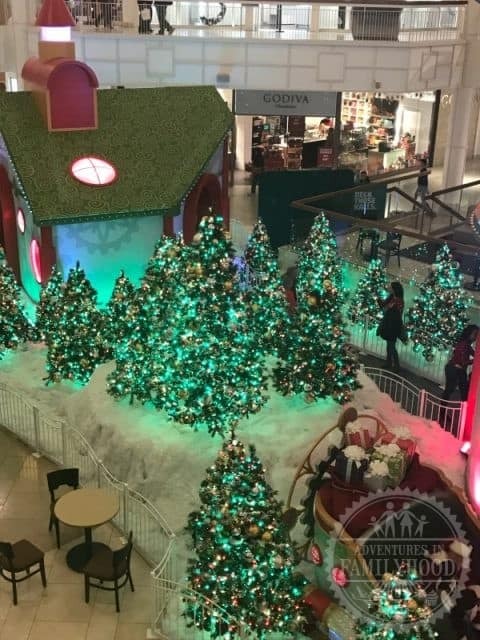 Consideration was paid to me by Macerich to review Santa HQ. The views expressed here are genuinely mine. The magic of Christmas comes to life in a stunning new holiday experience, Santa HQ. 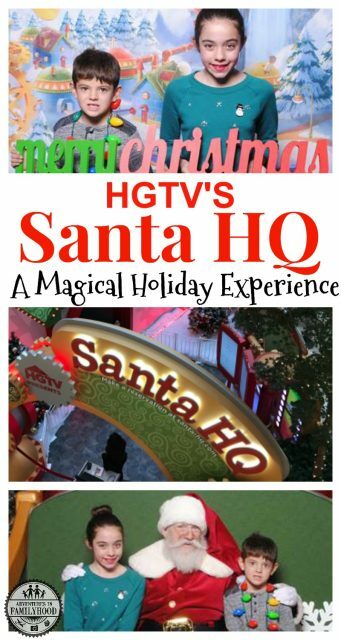 Presented by HGTV, Santa HQ whisks the traditional visit with Santa into the 21st Century. 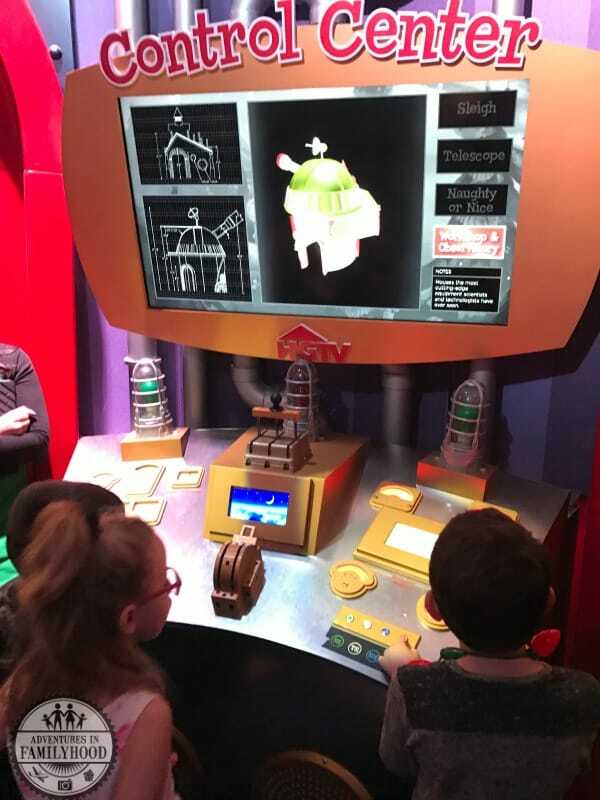 With hands-on activities and augmented reality experiences, Santa HQ is sure to delight the whole family. We recently had the opportunity to visit the Santa HQ location at the Danbury Fair Mall. 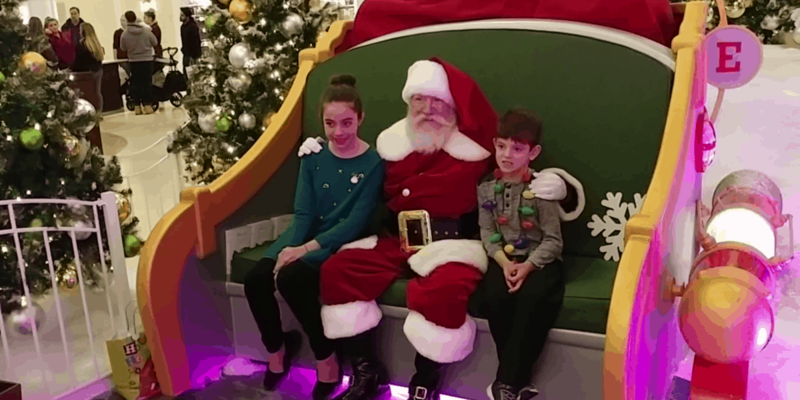 In our family, a visit with Santa is always at the top of our holiday to-do list. We were interested to see how this new twist on our yearly tradition would go over with our kids. I had a feeling Bella, our tween, would love it given all the technology. Not only did she have an amazing experience, but Jackson did too. And so did the kids of all ages we encountered in line. Even James and I couldn’t help but be blown away by some of the aspects of Santa HQ. 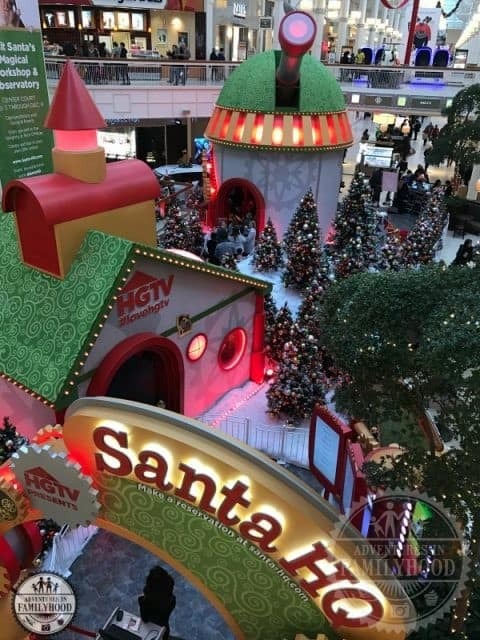 HGTV’s Santa HQ adds a whole new dimension to the yearly family Santa Claus visit. Here’s what you can expect. Santa HQ is designed with special triggers that reveal a series of augmented reality experiences. Before your visit, download the Elf-Ray Vision app on your mobile device. If you forget, no worries! Santa’s elves are armed with iPads to help guests experience this special feature. The triggers are located throughout the exhibit starting with two at the Entrance Arch. From there there is one on the exterior of the workshop, Toy triggers underneath the Christmas tree in the workshop and enhanced triggers in Santa’s Observatory (be sure to look up). Here’s a video of us playing with the triggers using the Elf-Ray Vision app. The experience begins with a true test of Christmas spirit, the Naughty or Nice Meter. 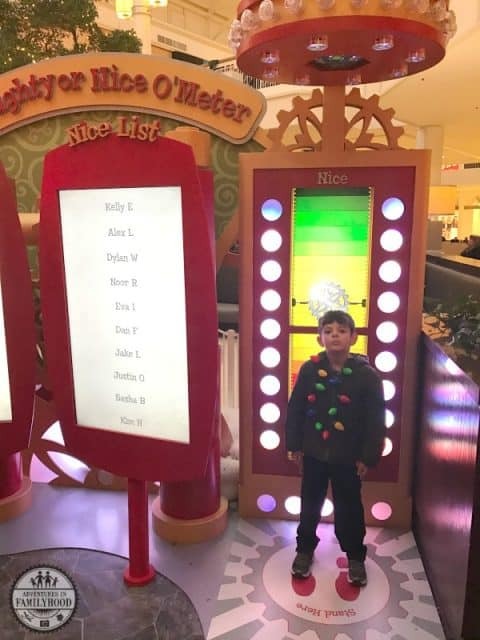 Here your kids can stand next to an interactive board to find out which of Santa’s list they’re on. Both my kids tried it out. The meter is really a sight to be seen. Lights flashed, music played, bells rang, the suspense was killing them. Lucky for them, they both ended up on the nice list. The next stop was Santa’s Studio. Here visitors can take an “Elfie Selfie” and star in their own holiday video. There is also an opportunity in this room to use Elf-Ray Vision to see Santa’s toy plans come to life. You can have your video emailed to you so you can enjoy it throughout the holiday season. After winding through a path of Christmas trees we made a visit to the Control Center. Here kids can track Santa’s reindeer, get behind the controls of Santa’s sleigh and check out the blueprints of the whole set-up. There are Elf-Ray Vision triggers in this room, with the most amazing one being on the ceiling. It was time for photos and a visit with the big guy himself. 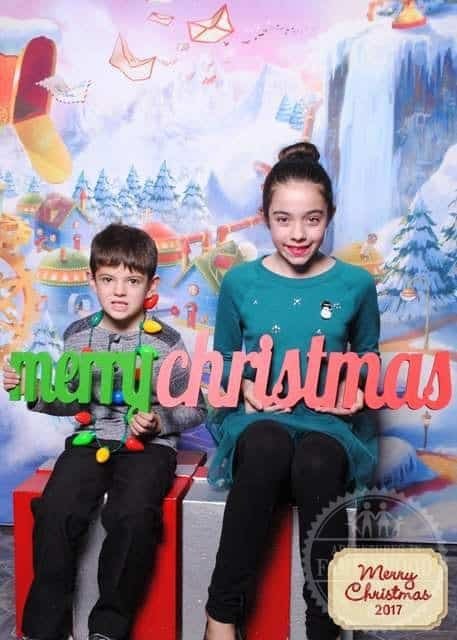 While we were waiting for Santa, my kids got a chance to take photos using some fun Christmas props. Then it was the moment we were waiting for, a visit with Santa! The kids climbed aboard his state of the art sleigh to let him know their greatest Christmas wish. Santa also gave us the scoop on his favorite Christmas cookie, Oatmeal Raisin! Both kids were presented with an activity book before we went on our merry way. Last but certainly not least, Santa HQ’s Christmas Trees come to life with a beautiful light show. More than 10,000 individual holiday lights are synchronized to the tune of “Carol of the Bells” to create an illuminated orchestra. 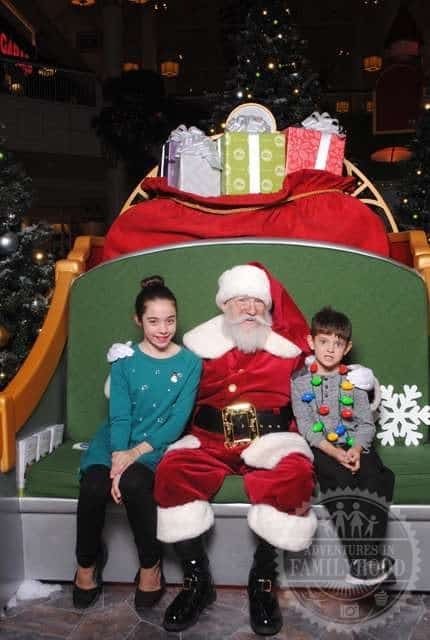 Visitors can now select the date and time of their photo session by making a reservation online at www.santa-hq.com/reservations. You can pre-pay for photo packages in advance as well. Though this is a reservation, you will not miss out on any of the fun, interactive features inside Santa HQ. It’s just a way to bypass line which can be long as Christmas approaches. We highly recommend this option if you have very little ones. Bring a new unwrapped toy to donate to HGTV’s Help Through Holiday Giving Drive. Santa HQ offers Sensory Santa nights and Family Pet Photo nights. Check with your location for details.